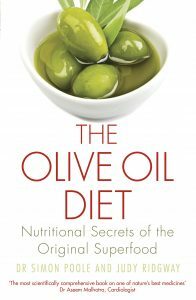 I am often asked “How much should I pay for a good extra virgin olive oil?” This is quite a difficult question to answer. The quick response is “as much as you can afford”, but there are oils which are very expensive which are arguably not worth the money that is asked for them and others that are quite reasonable in price but which rival some of the greats. 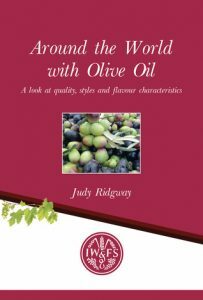 This month I am featuring a website which sells a range of top quality extra virgin olive oils from around the Mediterranean. At first glance the oils on sale look to be extremely expensive with some prices topping the £100.00 per litre mark. However, these oils are from renowned Italian producers such as Paolo Bonomelli in the Lake Garda region and Giorgio Franci in Tuscany. Both these producers are widely regarded as the best in their field and the award winning oils are produced in very small quantities. 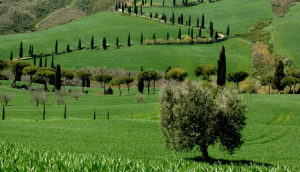 There are also plenty of more affordable oils on the site from other very good producers in Italy as well as in Spain and Tunisia and it is well worth trying oils from regions such as Puglia in Italy, Bobadilla near Malaga in Spain or Sidi Bouzid in Tunisia with which you may not be familar. There are seven producers featured on the site and here is a short run down on each one with notes on some of the 2018 harvest oils that I have tasted recently. This producer’s organic groves are located in Maknassy which is a particularly dry and sunny part of Tunisia.The estate dates back through three generations and some of the trees are several hundreds of years old, but the modern methods used today were introduced by Slim Fendri in 1995. An advanced irrigation system and a two phase extraction mill were part of the modernisation process and the company has joined QvExtra, an international association of premium producers. Today it has the reputation of a leader in Tunisian olive oil production . The Chemali olives (a local variety) give a herbaceous character to the generally medium style oil. As one of the cheaper oils on the site, Domaine Fendri offers good value for money for all round culinary use. This is another organic olive oil, this time from the Mejerda Valley in the North of Tunisia. The family company started its international operations in 1992 and is now well established in many countries. 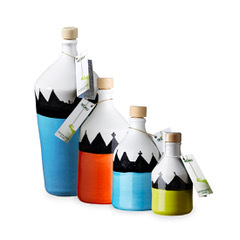 It offers a wide range of handcrafted products in addition to extra virgin olive oil, many of which are on sale on this site. The olive oil is pressed from the Chetoui olive variety which usually give quite delicate oils. The oils from this estate, located between two national parks and on the site of an ancient roman oil mill, repeatedly win prestigious international awards. The organic and biodynamic farm was fully modernised in 1998 and again in 2004 with the aim of achieving excellence. Success is confirmed by the fact that the farm was named world’s best organic olive farm in Flos Olei 2019.The mill is located within the estate allowing the olives to be processed within two hours of harvesting. The estate takes up 380 hectares with around 33,000 trees. Varieties include Hojiblanca, Arbequina, Cornicabra and Picudo. 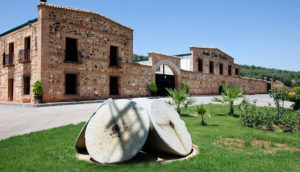 The Finca la Torre oils on this site are based on the Hojiblanca and Arbequina varieties. The 2018 Hojiblanca oil has a really complex aroma and taste of tomatoes on the vine with fresh herbs, mustard leaf and radishes and very well balanced bitterness and pepper all of which lingers through onto a long and attractive aftertaste. This is another multi-award winning family producer, this time based in the heart of Spanish olive oil production in Jaen in Andalucia. 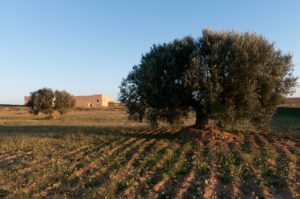 The olive groves are situated in a good position near the valley of the Guadalquivir river with its unique climate which causes important rainfalls during Spring and Autumn. The two farms of Los Juncales and La Casa del Agua are completely irrigated and though they are not yet ecological the oils are produced with a philosophy of respect for the environment. The system is fully integrated from farming to bottling, guaranteeing a perfect traceability to the consumer. There is a choice of extra virgin oils on this site with bulk offerings from the Casa del Agua estate along with varietal oils such as Arbequina and Picual. New to the range is a Frantoio varietal which has an amazingly vibrant hedgerow aroma of leaves and stalks and flowers and a deeply herbaceous taste of cut leaves, culinary herbs artichokes and chicory with extremely well balanced bitterness and pepper. You might also like have some fun with the Oro Bailen olive oil pearls. Sprinkle on dishes for a surprise burst of flavour. This is a family business, based near Bari in Puglia, which I have known and admired since I first started to work with olive oil twenty years also. But their family history goes back a good deal further than that with cultivation dating back to the 16th century and their first olive oil award in 1901. This has been followed by any more awards over the years. Two local varieties, Ogliarola, locally known as Cima de Bitonto, and Coratina are used together or individually to make the De Carlo oils. De Carlo Classico uses both varieties to make a very reasonably priced all-round oil which usually has a very nutty, lightly bitter character which is suitable for a varietey of culinary applications from dressing pasta and salads dishes to dipping with bread or raw vegetables. The second De Carlo oil on sale on this site is Felice Garibaldi which was originally named in honour of his more famous brother. Way back in 1835 Felice Garibaldi lay the foundations for historic changes in the way olives were harvested and pressed. These eventually led to the modern method of harvesting the different varieties separately and blending the oils later. This oil uses only Ogliarolo and is more delicate in character than the Classico oil. This is a man with a passion for excellence and the long list of awards from around the world for his oils confirm his success. Located in Torri del Benaco, on the eastern shore of Lake Garda, the groves benefits from a unique microclimate which gives its oils their particular character. Paolo Bonomelli’s boutique olive farm produces around 120 hectoliters a year with around 4,500 trees. He grows mainly local varieties, namely Drizzàr (also named Casaliva), Trep and Fort. When Paolo Bonomelli founded the olive farm in 1990, he built on the heritage of old local trees to develop his grove and focused his production process on the highest quality. The farm works with specialized professionals and is equipped with all the facilities and requirements necessary to ensure the complete monitoring of the production process “from the olive tree to bottle”. This approach together with an extreme attention to detail are the recipe for its success. It feels like a nursery for olive trees. Every tree has a tag with a number and color to identify it. The same care is taken during the harvesting and extraction process. It is possible to trace the full history of each bottle produced via the monitoring system, from the time of harvest (done by hand picking), to the name of the harvester and the time of milling and filtering. The impressive list of awards from across the globe is a great testimony to Paolo Bonomelli’s passion for excellence. Giorgio Franci is another producer whom I have admired for many years and who consistently wins the top awards around the world with his olive oils. He has been at the cutting edge of modern cultivation and extraction techniques for many years and I would not hesitate to say that his oils are worth their high price tags. The mill and groves are located in and around Montenero d’Orcia, a small hilltop town on the slopes of Monte Amiata in southern Tuscany. Frantoio Franci was set up in 1958 by Giorgio’s father Fernando Franci and the two joined forces in 1995. Together they developed a philosophy of absolute quality with emphasis on selection, interpretation and terroir with their first, intensely fruity, extra virgin olive oils from olives from one of their own groves, Villa Magra. This was followed by the more delicately fruity Olivastra Seggianese and then the medium style le Tebbiane. In 2000 Villa Magra Grand Cru was born using olives from the Chiusello grove, a micro-area where the Francis saw that the terrain and vegetation have very special features, giving the oil an outstanding polyphenol and and tioxidant content. Villa Magra Grand Cru is only produced in limited quantities in the best years.